Our Vision is simple, we shall be our customers obvious choice when selecting the right partners for their printed circuit board supply. We adapt to changing needs, find and present solutions, not limitations. Customers shall, supported by PCB Connect feel that they are close and have access to the best, most reliable, and most effective PCB solutions in the world. Through great openness and communication between all parties we create long term relationships for our customers, our suppliers and PCB Connect. We believe that a long term focus is the key to build stable and high quality solutions and enable possibilities to drive continuous improvements. Our long term focus is prioritized not only internally but also for our cooperations, relations and organisational structure. 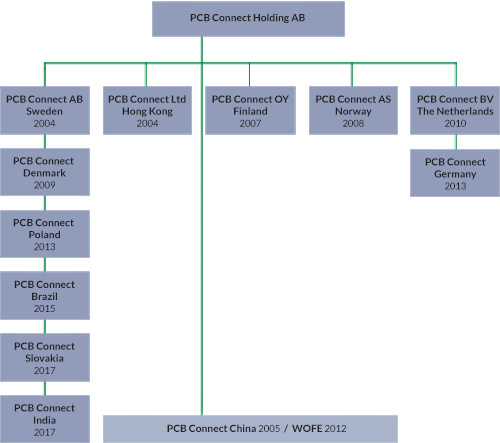 PCB Connect is a company with worldwide business, different cultures, laws, and opinions are part of our day. Through our business we have been given a great position to be part of and able to make a difference. We are people and our policies define not only what we are, who we are and how we act, it also defines what we shall achieve and what is expected from us within PCB Connect, our partners, in order to deliver the best support to our customers. Policies are shared internally and within our supply chain and are yearly reviewed by our management.